Looking at the backgrounds of accomplished filmmakers is a most interesting exercise, and to study the emergence of Florentine Films--now 30 years old--means learning about some of the most interesting and creative individuals of the documentary film. 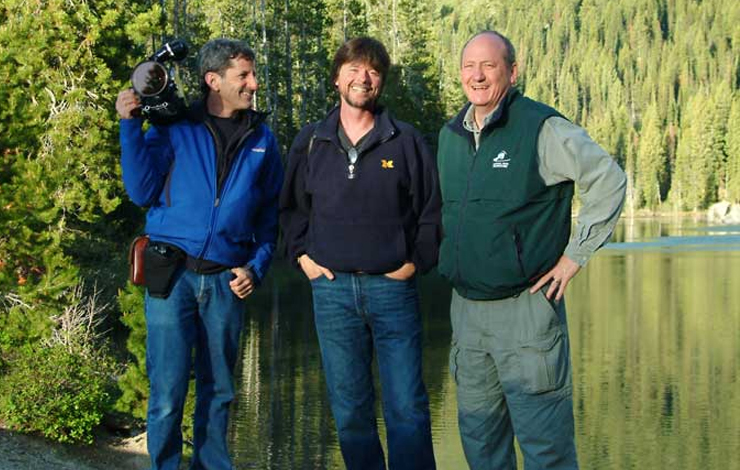 Ken Burns, Roger Sherman and Buddy Squires met and worked together as students at Hampshire College in Amherst, Massachusetts. Larry Hott, who did not actually matriculate at Hampshire, worked on films and learned much of his art there, although he began his career as an attorney, having attended nearby Western New England Law School. The four would later be joined by other industry notables such as Diane Garey and Amy Stechler. This wellspring of talent would go on to create some of the most honored documentary films of our time. Hampshire College's Western New England base has been a creative crucible for a range of notable artists such as Norman Rockwell, Edith Wharton, Herman Melville, Daniel Chester French, Nathaniel Hawthorne and James Taylor. When Burns, Sherman and Squires attended Hampshire College in the early 1970s, it was a new, experimental institution. "It was a brand new place," reflects Squires. "Everybody was trying to figure it out. It made for a very special, special time. It created a sense of community that I think was quite rare." "It was the most wonderful field experience you could possibly imagine," adds Burns. "We learned how to tie ties. We learned how to write budgets. We learned how to write proposals, make speeches, work with other people and sell our ideas." "I started taking film classes in the same way any art student would try other mediums," explains Sherman. "The college was an amazing concentration of great teachers and some modest equipment and no money," Burns recalls. "In order to practice our craft, teachers there decided to form a group called Hampshire Films. This facilitated a production of films by students for nonprofit groups in the area of western Massachusetts. "We were not paid anything," Burns continues. "No rental was charged to the clients. We basically made these films for nonprofit clients at cost. It really put us into the real world in a very interesting way. Those of us who were there were able to work as assistants to upper-classmen and later take over projects of our own." Elaine Mayes and Jerome Liebling are names that are inescapable when one speaks to any of the original Florentine mavericks. Both Mayes and Liebling were still photographers and had taught at the University of Minnesota before coming to Hampshire. At the time, film and still photography were not taught separately because budget and resources just didn't allow it. Sherman points out that this cost consideration turned out to be an asset in learning to visually tell a story. "We learned how to make films that way under the really remarkable supervision of Jerome Liebling and Elaine Mayes," explains Burns. "So it became for me, at least, perhaps a nave but kind of logical extension that once we got out of college, instead of apprenticing ourselves to some pre-existing corporation, we would just start our own in the same egalitarian model." Sherman credits Liebling for teaching him that "education was about seeing," and he learned to ask questions such as "Why are you looking at that? What are you trying to achieve?" "Seeing is what it's all about," Sherman continues. "I try to be the audience whenever I make a film. I think what came out of that education was that telling a visual story was most important--as important as what people were saying." "They gave us a solid grounding in documentary photography," adds Squires. "There was individual emphasis on the importance of looking, the importance of seeing. Not all documentary filmmakers came from a school of thought where the image is superior." Squires also notes that his early educational grounding "included a constant exposure to a huge range of influences such as Helen Levitt, Dorothea Lang, Michael Snell and many others." Today, Liebling is retired from Hampshire College, but he still lives in nearby Amherst. "Fortunately for all of us, it's close enough that we see him all the time and we count him among our most beloved friends," says Burns. "And he's still a mentor to all of us." According to Elaine Mayes, after they graduated from Hampshire College, Burns and Sherman, along with Mayes, formed the original Florentine Films. Burns, Sherman and Squires later formed the Florentine Films that exists today. "We borrowed the name from Elaine Mayes' hometown of Florence, Massachusetts," explains Burns. "We starved for a few years and got day jobs from the BBC and Italian television and made short, little industrial films." In the early days of Florentine Films the trio, later joined by Hott, capitalized on each other's talents and credits and positioned themselves as filmmakers already planted in a New England location halfway between New York and Boston. "Roger and I worked on Ski New Hampshire [a promotional film for a New Hampshire tourism concern]," Hott recalls. "Ken was working on getting grants." Hott later made a film entitled The Old Quabbin Valley (1981), about the politics of water in Massachusetts. Burns' appetite for history led him to read The Great Bridge by David McCullough. "I set my sights on making a major film that eventually was broadcast on public television on the history of the building of the Brooklyn Bridge," explains Burns. "It was all hands on deck. We did that, and it sort of proved that the model could still work." After raising money and producing the film, The Brooklyn Bridge was released in 1981. The next year, it was nominated for an Academy Award. "Ken was kind of our leader," says Hott. "Everyone wanted to play lead guitar and sing, but it couldn't function that way." Hott explains that the Florentine consortium consulted an attorney, who suggested that the foursome form a trade name association among them, whereby nobody else could use the name, they would indemnify each other, and all could go their independent ways and still use the name Florentine Films. And so they did. "I continued producing, as did Roger Sherman--after a long stint as a sound man--as did Buddy," explains Burns. "With periodic forays into producing, Buddy remained as he still is today, a pre-eminent cameraman. Larry Hott continued to produce films from the same area of western Massachusetts. The nucleus of Roger, Buddy, Larry and I have remained as good friends as you can imagine." The early fruits of the Florentine four's learning and labor offer much to subsequent generations seeking the same creative path. So what should the rising filmmaker glean from their experiences and talents? Burns emphasizes the importance of remaining flexible; he quotes the late author Robert Penn Warren (All the King's Men), who appeared in Huey Long. Warren had said, "Careerism is death," a statement that motivated Burns to pursue and focus on what is true for himself, rather than follow a scripted career path. Burns points to an episode from his Hampshire days in which he and Liebling had disagreed on something, Liebling pushed a point and Burns pushed back, and eventually Leibling let go. That was the point from which Burns would follow his intuition. Squires also placed much importance on his self-reliance and passion. "I didn't really have any expectations other than I wanted to make films," he explains. "I wanted to go about it in a collaborative way and make films that were of interest to me. You have to be excited about it." The Florentines often use the term "self-initiated documentary film" to describe the passion within, the lifeblood of the rugged individualism that they employed. Sherman explains that a general liberal arts education is good and helps one shape one's own areas of interest. "It's much about passion," he says. "The documentary field has changed over the past 30 years. But people's passions have changed. I think that is what makes a great film today." What Sherman drives home as one of the most valuable skills for a rising filmmaker to have is the ability to write. "No matter what you do, you'll be writing," says Sherman. "The filmmaking part is like dessert." He emphasizes that there are so many other things that need to be done on a film project. "Writing is one of the most important things." Hott can't exactly boil it down to one thing, but says, "You do need a good grounding in the humanities." Like Sherman, Hott emphasizes the importance of being a good writer. He believes that you should understand and realize your own limits of talent and acquire the skill of someone who is better than you are at something. "Do not try to be everything," says Hott. "There are very few people who can do it all." "Filmmaking is a very raw and naked pursuit," says Squires. "Most of the work that gets attention comes from an expression that filmmakers care about and believe in."